Welcome to Dental Center of Simi Valley! We know that you have several options in choosing your dentist in Simi Valley, and we appreciate your interest in our practice. 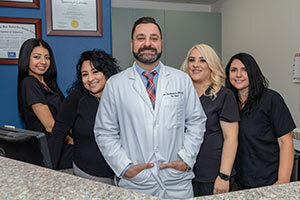 Dr. Harmik Hartounian, known as "Dr. Hart" to our patients, offers the full spectrum of general, cosmetic and implant dentistry services in a family-friendly environment. When you visit our practice, you will see right away that we value honesty and quality, and, of course, patient comfort. Patients who visit Dental Center of Simi Valley are welcomed by friendly, knowledgeable staff who are always happy to answer questions regarding treatment, financing, and insurance. Our comfortable dental office in Simi Valley is equipped with up-to-date technologies, including lasers and digital x-rays. Each of our treatment rooms has television with personal headphones, allowing patients to tune in to Netflix, YouTube, or Pandora. Our dentist in Simi Valley, Dr. Hart, is trained in a wide variety of dental procedures. From fillings and cosmetic treatments to Invisalign to dental implants, our treatment options are tailored to your needs. Members of our staff speak Armenian and Spanish, as well as English, enabling us to reach out to more patients in the communities of Thousand Oaks, Porter Ranch, Moorpark, Chatsworth, and Simi Valley. If you would like to learn more about our services, staff, or training, give us a call. Our dentist and staff are always happy to speak with new and existing patients! Our dentist in Simi Valley offers general, family dentistry and cosmetic dentistry in Simi Valley. Copyright 2016 © Dental Center of Simi Valley. All rights reserved.